Pool gifts are the Secret Santa of Christmas in Upstate New York. It’s cold out, snow is on the ground, you aren’t thinking of pool gifts for holiday shopping, which is exactly why they should make it on the list. Not only will you get something people will use and need, but retailers like marking everything up in the spring and down in the winter so you are in line for some great deals. There are as many lists of cool pool toys as there are types of pools, but this list is different. Rather than describing the different options available, we are sharing what works best for who. Age, lifestyle and preferences will be the guide for selection rather than what’s “hot” right now. Use this guide to find a cool pool toy to carry the excitement of a summer well spent into the cold winter months. Hey, maybe even give one as a gift to your family, friends, or yourself! It is never too early to get ready for next summer. The pool is a place for family fun and you’re never too young to take part. Although babies require extra supervision, their adorable smiles and belly laughs make all of the extra effort worth it. Finding the right float for your little one will enhance both of your experiences in the pool. Be sure to read the directions, suggested use and warnings before using it though. From classic to new age, there are a lot of options for kids to choose from. If your child is just learning to swim, investing in some assistance to help out is a great idea too. Floaties, minimalistic life vests and swim lessons are all great options. Young adults are really just children in adult bodies. They are merging from childhood to adulthood. Likewise, they appreciate novel games that the kids enjoy as well as luxurious relaxation geared toward responsible adults. Young adults usually want to have fun and look cool while doing it, so fancy and high tech pool toys are typically a win with them. 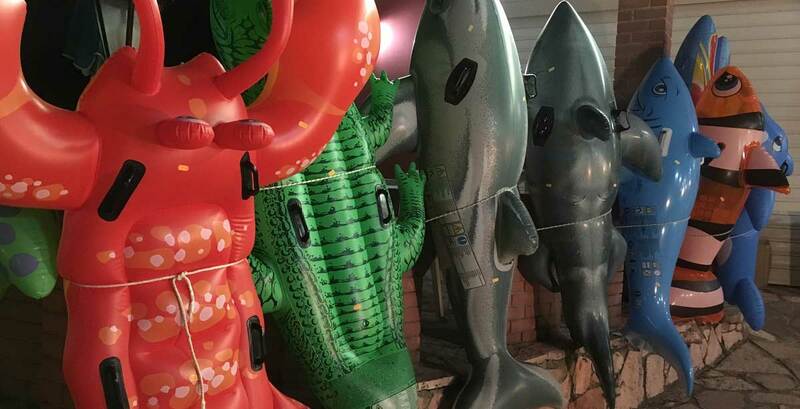 Adults can enjoy all of the pool toys. If they have a little one, then a baby float is a perfect purchase. Parents of small children will enjoy engaging pool toys that give them something to do with their kids, or keep the children busy for awhile. Likewise, adults enjoy novelty, fashion and high intensity fun as much as young adults do. So, they can enjoy anything previously listed. There is something for everyone. Ultimately, pool toys transcend age and really are a matter of lifestyle and preference. In fact, you may find a full grown man accepting the challenge of fitting into a baby float. There is just no telling who will enjoy what. The only thing for sure is that pools are meant for relaxing and enjoying each other’s company and the right addition can enhance them both. For all ages and lifestyles pool toys are a way to maximize relaxation and socialization. They help you get more out of the two reasons you probably purchased a pool in the first place. Plus, they are great gifts or stocking stuffers!